Today, slightly more than one-fourth of registered voters in the United States have political views and social attitudes placing them in the camp of the “Resistance” — to President Trump and the Trump-era Republican Party. This is one of the five American “tribes” identified in a sweeping new public opinion survey conducted by RealClear Opinion Research, a new service offered by RealClearPolitics. 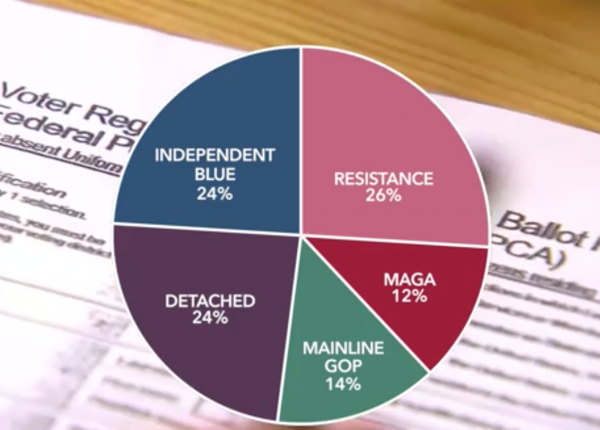 The survey of 2,463 registered voters, conducted Sept. 18-28, was overseen by John Della Volpe, co-founder of SocialSphere Inc., a public opinion and analytics firm based in Cambridge, Mass. On the other side of the spectrum are two “tribes” of Trump voters, roughly evenly divided, which together make up another quarter of the electorate. One of these groups (12 percent) is the Trump base — the “Make America Great Again” crowd that attends his rallies and idolizes his brand of conservative populism. The other (14 percent) consists of traditional Republicans with less edgy views on issues ranging from trade to immigration to race relations. A fourth group, which Della Volpe has dubbed “The Detached,” is even harder to peg. This segment is the youngest of the five, and the most male. They tend to be disillusioned, even disgusted, by party politics, and represent 24 percent of registered voters in the United States. A fifth cohort, the “Independent Blues,” is the most pivotal group. In 2016 they cast their ballots for Hillary Clinton by a 12-percentage-point margin, and their skepticism toward Republicans has only grown in the ensuing two years. Just 16 percent of them say there is a strong likelihood they’ll vote for Donald Trump in 2020. By a margin of 47 percent to 28 percent they express a preference for a Democratic-controlled Congress. What this group wants – and how many of them turn out to vote – could determine the makeup of Congress when Americans go to the polls in this year’s mid-term elections. Eighteen years ago, RealClearPolitics pioneered the averaging of public opinion polls, a concept now generally accepted and widely practiced. Under Della Volpe’s direction, RealClear Opinion Research seeks to delve deeper into what informs Americans’ political views. It is not a horse race poll. Nonetheless, another conclusion that can be drawn for this data is that political professionals from both major parties, along with the new media, spend far too much time focusing on reactions from the far left and far right of American politics. Among those too often forgotten are those in the middle, the tribes we call the Detached and the Independent Blues — fully half of America’s registered voters. Carl M. Cannon is the Washington Bureau Chief for RealClearPolitics.